Next month I will be taking a critical look at the fashion for and fabrication of eighteenth-century French-style interiors in the Gilded Age American mansion as part of the panel “Fantasies of Aristocracy: England and the American Renaissance” at the 72nd Annual International Conference of the Society of Architectural Historians in Providence, RI. Above: Salon, John Jacob Astor IV Residence, 840 Fifth Avenue, 1895 (photo ca. 1912). LOC. We define ourselves by the spaces we inhabit—how we imagine and design them, how we adorn and conduct ourselves within them, how we manage and control access to them, and how we present them to others. In the Gilded Age, America went to work on its largest and fasted-paced identity management scheme in history. Roles and institutions were turned upside down by Industry, immigration, wealth, and technology, and what it meant to be ‘American’ shifted, expanded, narrowed, unified, and diversified, occupying a critical place in the public consciousness both domestically and internationally. For the elite sector, building, furnishing, and collecting were key in the establishment of social identities deemed appropriate for a new (the first), moneyed millionaire class. These were the traditions of the aristocracy, the cultured, the leisured, and the noble, and they were to be adopted as part of the flexing of the civilized American muscle. However! They were not, as many have surmised, adopted without intention, discernment, or difference. So what can an analysis of Gilded Age design and decorating practices tell us about this foundational period in our history? My interests are primarily in the (private) interior—this is where the action happens—and in the presentation of self and selves through the display of and interaction with space, objects, and others. My research for the next few years will focus on the adaptation of European, namely French, precedents in interior design and on the recontextualization of storied objects and peoples in interior decoration. On historical branding, as it were, for the fashionable modern American. Research will involve a variety of themes and topics, including transatlantic antiques trade, the rise of the dealer-decorator, historiography and the historical impulse, technological advancement, and the style icons that were Marie Antoinette and the Marquise de Pompadour—regularly conflated, rarely contradicted. My hope is that, by understanding some of the means of and motivations for Gilded Age building and decorating, we may more accurately assess this significant period and its lavish practices (How can Louis XV boiserie be modern or American? ), and approach a more systematic review of its contents, creations, and contributions. And, let’s face it, take decoration seriously. A more concise explanation in the form of my official proposal to follow. Above: Ladies’ Reception Room, The Breakers, Cornelius Vanderbilt II Residence, Newport, RI, 1893-95. The Preservation Society of Newport County. This week I am exploring my Nashville roots in the stories of my great-great-grandfather George R. Stuart and his brother, Ambrose Gaines ("Uncle Am") Stuart. One a preacher, the other a safe-cracking fiddler, both made lasting contributions to the city’s legacy and their divergent stories come together in one of its most iconic buildings: the Ryman Auditorium. George Rutledge Stuart was born in Talbott or Talbott's Station, Tennessee, a small village on the Southern Railway just north of Knoxville, in 1857. He was the youngest of four sons (with one sister) of Caswell Cobb and Maria Martin Stuart (née Worley). After his father, a prosperous antebellum merchant and proprietor, lost everything at the close of the Civil War, George, then still a child, worked the various farms to which the family relocated, attending school and eventually taking up teaching. In 1880, George left for Emory and Henry College in Virginia at the encouragement of the then-president Dr. David Sullins (founder, Sullins College, Bristol, VA, closed 1976), where he worked his way through education and graduated in 1882. He married Sullins's daughter Zollie at the college chapel in September of the same year. 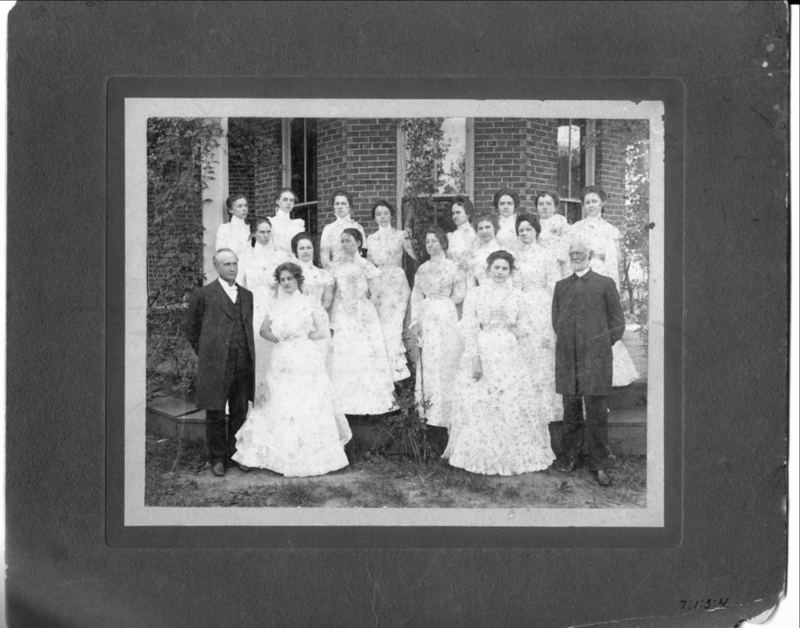 In 1884, the centennial of the Methodist Episcopal Church in America, George founded Centenary (Female) College in Cleveland, Tennessee (my hometown), where his father-in-law became president in 1885. Around this time, George became acquainted with the popular evangelist Sam P. Jones (1847-1906), whose daughters, it seems, attended the college. From then George became Jones's close co-worker and "constant companion," (one 1902 source describes him as Jones’s “complement” rather than his “counterpart,” stating that he “has much of the power and many of the strong points of Mr. Jones without those for which his co-worker has been censured by some") and eventually began a career as a traveling evangelist, temperance lecturer, and "one of the greatest orators in the South." Collins Studio - New York, Rev. G. R. Stuart. University of North Texas Libraries, The Portal to Texas History, photo: Anderson County Historical Commission. For years George toured the nation with Rev. Jones preaching at some of its largest and most highly attended conferences and assemblies and inspiring, according to one ca. 1900 source, "more [...] moral reforms than any other man in the South." The most famous of George and Jones's converts, however, was one Thomas Ryman, the prominent Nashville businessman for whom the Ryman Auditorium, 'Mother Church of Country Music,' is now named. In 1885, Tom Ryman, who had profited after the Civil War on steamboats that carried both trade goods and raucous entertainments along the Cumberland and Ohio Rivers, attended a "tent revival" held on the corner of what is now 5th Avenue (then Summer Street) and Broadway in Nashville, where he heard Rev. Jones speak. According to accounts of the occasion, Ryman, who had spent "'a good part of his life serving the devil'" (i.e. drinking, etc. ), was converted that day and henceforth took up a gospel mission, having proceeded, reported (somewhat hyperbolically) The New York Times, from the revival to the wharf and "as his boats came in, knocked them into kindling wood, and emptied the whisky into the winding Cumberland." Ryman promised Jones that he would construct a space large enough to hold thousands of people indoors, and in 1892 the Union Gospel Tabernacle, "the largest and most scientifically constructed convention hall in the South," opened to the public. Centenary College, Cleveland, TN, ca. 1890 (now the site of Lee University). UTK Libraries. Centenary College group, ca. 1890, showing Dr. David Sullins at right. UTK Libraries. Ladies' meeting (revival) at Union Gospel Tabernacle, conducted by Rev. Sam Jones, 1896. TSLA. When Ryman died in 1904, both Jones and George, "who loved and was loved by Capt. Ryman," spoke at his funeral, for which more than 4,000 people gathered at the Tabernacle on Christmas Day. According to a report in The Nashville American (The Tennessean): "Beautifully and eloquently did Mr. Stewart [sic.] pay his tribute to the life of Capt. Ryman," stating that, "'A city never gets over the fact [...] of a great man living so humbly, one whose great spirit has been exalted to that blessed home. I say with Brother Jones that I lay the sweetest and the rarest flowers of my heart upon this great man's grave.'" It was following the conclusion of these remarks that Jones suggested the name of the Tabernacle be changed to Ryman Auditorium. When Rev. Jones died suddenly in 1906, George conducted his funeral services in Cartersville, Georgia. Eventually George returned to the pastorate, though he continued to lecture extensively through the 1910s. He died on May 11, 1926 in Birmingham, Alabama. Among his published works were: The Stump Digger: A Sermon on Temperance (1896), Sermons (1904), Stories and Parables to Illustrate Gospel Truths (1907), Famous Stories of Sam P. Jones (1908), and What Every Methodist Should Know (1922). George R. Stuart Elementary School in Cleveland, Tennessee, and George R. Stuart Auditorium in Lake Junaluska, North Carolina are both named for him. George R. Stuart with pony "Pasha," outside his residence on 17th Street in Cleveland, Tennessee (now the site of Faith Memorial Church). Photo: family collection. 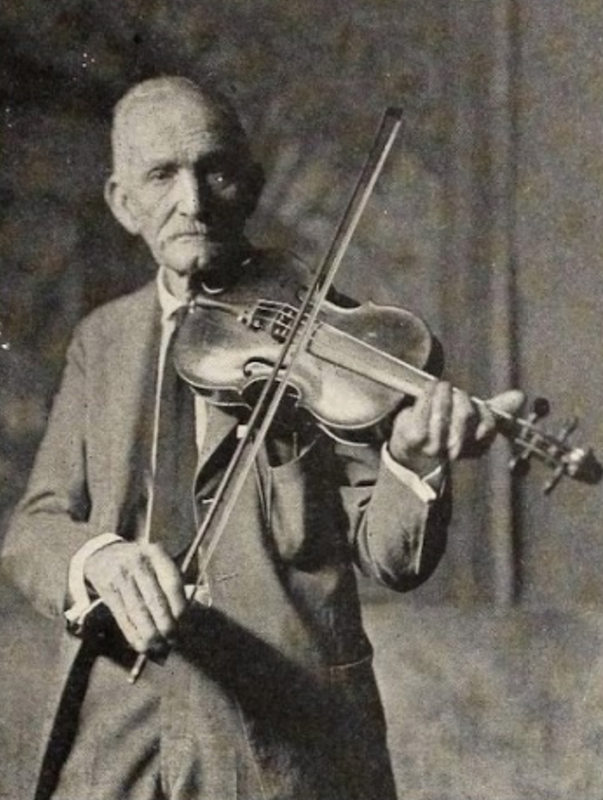 While George R. was traveling the region spreading his gospel with Mr. Jones, his older brother Ambrose was gaining notoriety as one of the best fiddlers and slickest (professional) safecrackers in the East. Though less is known about his personal life and history, “Uncle Am,” as he was called, made no less an impression upon his audiences, becoming, at the ripe old age of 73(ish), one of the first Tennesseans to commercially record country music in the early 1920s. Stuart, second from right, at the Fiddlers' Convention in Mountain City, Tennessee, May 1925. Also pictured, L to R: Al Hopkins, Joe Hopkins, Alonzo Elvis Alderman, John Rector (the "Hill Billies"), and Fiddlin' John Carson. Southern Folklife Collection, Wilson Library Special Collections, UNC. Am’s real career, however—at least, the one for which he is primarily remembered now, began late in life. In the early 1920s, “hillbilly” music (as country, i.e. Southern white folk, music was known until 1949) represented a new market in the burgeoning record and radio industries, the former at the time suffering from the success of the latter. In a bid to reach new audiences, recording companies, OKeh and Columbia chief among them, recruited well-known regional musicians to travel to the big cities (Atlanta, New York) to record. In 1923, OKeh released the first commercial country recording featuring “Fiddlin’” John Carson, and in June of the following year, Uncle Am traveled to New York City to record with the Aeolian-Vocalion Co., one of the first Tennesseans to do so. While in New York, Am recorded at least fourteen selections, including “Cumberland Gap,” (listen here) “Grey Eagle,” “Old Liza Jane,” and “Waggoner.” He also performed for several radio broadcasts, a form of country listening that would reach its peak in the still-popular Grand Ole Opry, begun the following year (November 28, 1925) and broadcast from the Ryman Auditorium from 1943 to 1974. In 1925 Uncle Am attended the famous Fiddlers’ Convention in Mountain City, Tennessee, where he competed against rivals and friends Charlie Bowman, John Carson, Dudley Vance, and others, taking home third (?) prize. In February of 1926, he added Champion Fiddler of the Middle Atlantic States to his list of titles when he won an “incognito” contest (for which Charlie Bowman acted as master of ceremonies) conducted from WRC Station in Washington, DC. He died of pneumonia at his home in Bristol, Tennessee/Virginia a month later, just two months before his younger brother George. Header photos: (L) Dr. Geo. R. Stuart, photo published in a Chautauqua brochure, ca. 1905. Redpath Chautauqua Collection, University of Iowa Libraries, Special Collections Dept. (R) "Uncle Am" Stuart, photo from a Vocalion-Aeolian ad in The Talking Machine World, August 15, 1924: 53. "Best in Three States—Uncle Am, a Champion Fiddler of South, Can't Read a Note (New York)," Los Angeles Times, Aug. 2, 1925: 7. Bob L. Cox, Fiddlin' Charlie Bowman: An East Tennessee Old-Time Music Pioneer and His Musical Family (Knoxville: University of Tennessee Press, 2007). 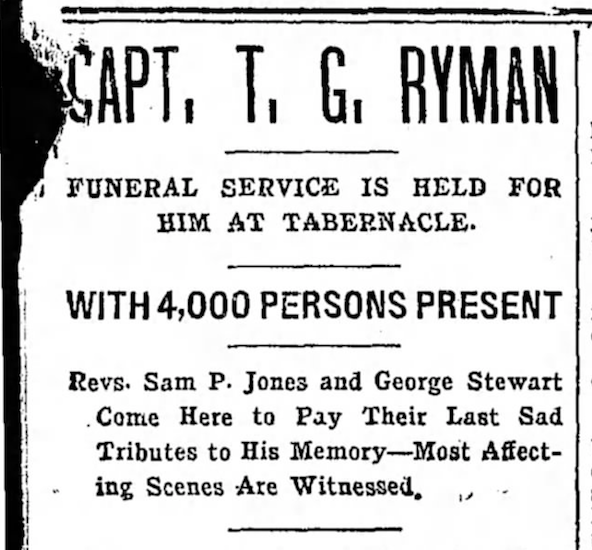 "Captain T. G. Ryman: Funeral Service is Held For Him At Tabernacle," The Nashville American (The Tennessean), December 26, 1904: 5. "Centenary College," in "Higher Education in Tennessee," Bureau of Education Circular of Information 5, no. 16 (Washington: GPO, 1893): 259-60. Charles K. Wolfe, in assn. with The Tennessee Historical Commission, Tennessee Strings: The Story of Country Music in Tennessee (Knoxville: University of Tennessee Press, 1977). Charles K. Wolfe and Ted Olson, eds., The Bristol Sessions: Writings About the Big Bang of Country Music (2005). David Sullins, Recollections of an Old Man: Seventy Years in Dixie, 1827-1897, 2nd ed. (Bristol, TN: King Printing Co., Leroi Press, 1910). Ed Byrne, "Before It Was The Ryman," Tennessee State Library and Archives Blog, June 27, 2016 (http://tslablog.blogspot.com/2016/06/before-it-was-ryman.html). "Fiddlers' Contest from WRC Tonight: Charlie Bowman, Of Tennessee, Will Challenge Middle-Atlantic Champion (Washington)," Baltimore Sun, Feb. 9, 1926: 26. "George Rutledge Stuart," in Thomas N. Ivey, ed., The Southern Methodist Handbook (Nashville: Southern Methodist Publishing House, 1916). "'Hill Billies' Make A Big Hit With Two Performances: Uncle Am Stuart Proves Popular Favorite With Audiences," Kingsport Times, July 19, 1925: 6. Pat J. Ahrens, Union Grove: The First Fifty Years (1975). Paul Kingsbury, Michael McCall, and John W. Rumble, eds., The Encyclopedia of Country Music, 2nd ed., compiled by the staff of the Country Music Hall of Fame and Museum (New York: Oxford University Press, 2012). "The Rev. Dr. G. R. Stuart: Widely Known Evangelist Dies in Birmingham, Ala.," New York Times, May 18, 1926: 25. "Sam P. Jones Dies Suddenly On A Train," New York Times, October 16, 1906: 9. Ted Olson, "Victor Talking Machine Company sessions in Bristol, Tennessee—The Carter Family, Jimmie Rodgers, Ernest Stoneman, and others (1927)," National Recording Registry, Library of Congress. "Tom Ryman of Nashville," New York Times, December 26, 1892: 2. "Uncle 'Am' Is Back Again For Visit to New York—Tennessee Fiddler, Who Is Expert Safe Man, Tells of Hold-Up by Frank James (New York, July 12)," Los Angeles Times, July 13, 1924: 37. 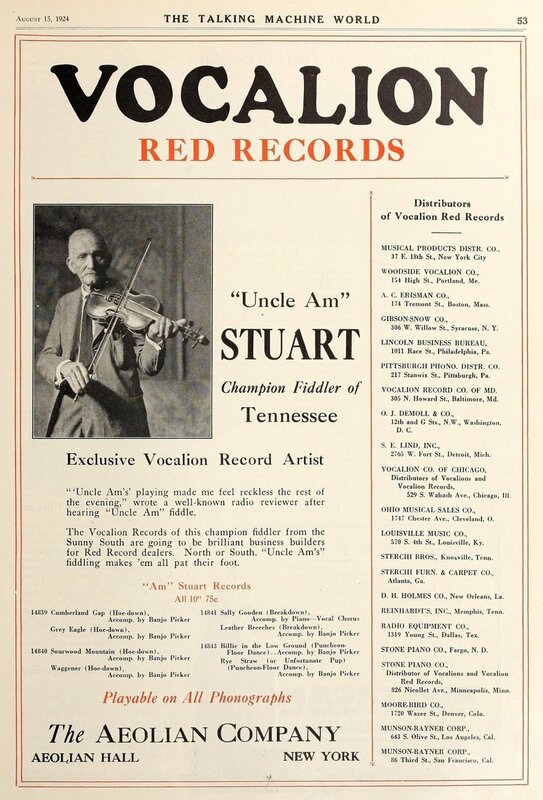 "'Uncle Am' Stuart, Violinist, Is Dead," Kingsport Times (Kingsport, TN), March 19, 1926: 5. W. W. Pinson, George R. Stuart: Life and Work (Nashville: Cokesbury Press, 1927). A couple of months ago I participated in a thought-provoking conference at Brown University that reconsidered 'reuse' in a broad cultural context. Revisiting my presentation for writing now, I find myself again grappling with one of its central metaphors: the 'life,' and afterlife, of architecture, objects, and design. For a Gilded Age scholar, the discussion of reuse is unavoidable: Gilded Age architects drew regularly, often directly, on historical styles and treatises; dealers amassed volumes of historical and other objects from declining European estates (already full of 'reused' things) for redistribution in the US; and patrons adopted and adapted freely the elements of high cultures past that most suited their contemporary ambitions as a new social elite. As part of this discussion, objects are often considered in terms of 'lives' and 'afterlives,' denoting, generally speaking, their roles in the contexts for which they were originally created and the roles that they assume in other contexts later. But as I struggle to unravel the 'life' of a tub that was based on ancient Roman designs adopted by the French in the eighteenth century and rediscovered in turn-of-the-century America by way of Victorian England, quarried and carved from 'antique' stone ca. 1880, installed in a Renaissance-style mansion on modern Fifth Avenue and dispersed with the rest of its contents in the 1920s (you get the idea), I can't help but wonder: Is the biographical metaphor the most efficient, or the most appropriate? Why do we use it in the first place? And what are its benefits and drawbacks? The most obvious explanation for the biographical metaphor is, simply: we're humans. We're born, we live, we die, we ostensibly live again in alternative form or meaning, and this is our readiest framework for the understanding (and creation) of other things. And it is useful in many ways. For historians, and particularly art historians, the biographical metaphor serves as an organizational device that helps to define and contextualize periods of significance and change. This, in turn, helps us to understand the meaning and value of objects for individuals, groups, and cultures over time. We recognize, for example, that objects are experienced differently in different settings, and that objects, designs, spolia, etc., take on new meaning (or, in common phrase, are 'given new life,' in an architect-as-demigod sort of way) when removed from their original context. For all its advantages, however, the biographical approach to objects and architecture also has significant shortcomings, some of which can be fatal (no pun intended, but there we are) to well-rounded scholarship. The first flaw in the biographical metaphor is the first flaw of all interpretive categorical devices: it inherently prioritizes certain periods and elements over others, creating false boundaries and giving naturalized authority to manmade schemata. Is Boucher's The Toilette of Venus any more or less significant in the Metropolitan Museum of Art now than it was in Madame de Pompadour's bathing pavilion in 1751, or in Alva Vanderbilt's boudoir in 1880? Which is its life and which is its afterlife? The second is that it can give rather too much agency, imbibing inanimate objects and structures with a sort of Hegelian spirit or Vasarian genius that distracts, again, from the fact that they are crafted and given meaning by humans. Do things have lives if we don't delineate them? Does the stonework from the A. T. Stewart mansion now incorporated into Our Lady of Lourdes Roman Catholic Church 'live' in the same way if no one knows, or cares, that it's there? And this begs the final question of: When do objects die? I for the most part have been considering physical objects, but what about the memory of objects, or, to use an example from my current work, descriptions of objects for which there is no physical evidence? How do we interpret these as elements of an object's or building's story? And what about cast, copied, or misattributed objects? If Salvator Mundi turns out not to be a Leonardo, what happens to the biography we're writing for it now? This week I attended the preview and opening of World War I and American Art, the first major exhibition to explore American artists' involvement in and representation of the First World War, at the Frist Center for the Visual Arts in Nashville. 100 years after US entry into the war, the exhibition, organized by the Pennsylvania Academy of the Fine Arts (PAFA), brings together more than seventy artists and a range of media—from grand manner paintings to digitized memoirs—to examine the impact of 'The Great War' on American art, and vice versa. It coincides with a number of other centennial exhibitions and symposia (SAHGB 2018 Annual Symposium: Architecture, the Built Environment, and the Aftermath of the First World War; World War I Centennial: Smithsonian Commemoration) designed to expand and reframe conversations about the war, and addresses a significant gap in what curator Robert Cozzolino called the "conventional wisdom" of American involvement, namely, the idea that the war didn't affect Americans or American art very much "because we weren't 'in it' very long." One of the strengths of the exhibition is its scope: organized loosely chronologically to follow a thematic progression from Prelude to Celebration and Mourning, it invites viewers to consider a range of experiences, interpretations, and perspectives, from personal and memorial to professional and documentary to political and propagandistic. It also highlights significant and little-talked-about aspects of several major artists' careers. 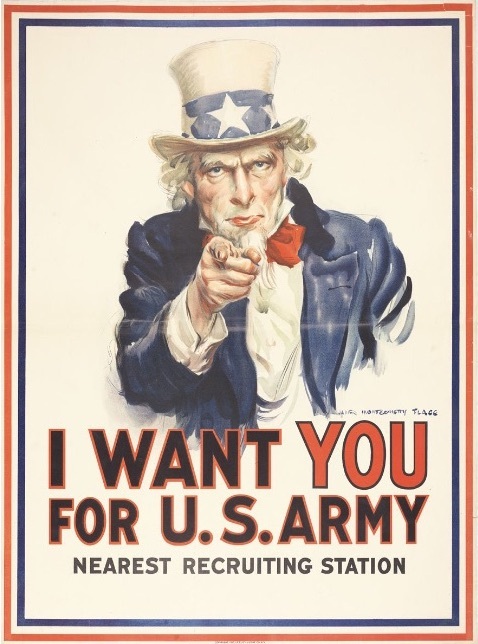 Perhaps the most recognizable image in the exhibition is James Montgomery Flagg's I Want YOU for U.S. Army poster of 1917. Here we get into the more familiar historical territory of propaganda and America-to-the-rescue. While highlighting the romanticizing nature of art designed to bolster support for the war and encourage recruitment, however, the exhibition also makes note of another important facet of propaganda in this period: the visualizing of an 'Other' as part of a national identity formation. Harry R. Hopps's Destroy This Mad Brute—Enlist (ca. 1917) plays on fears of immigrant "dilution" of American social and moral structure by depicting Germany as a violent gorilla that has abducted a distressed, bare-breasted maiden—a reference to both the idealized middle-class woman, whose virtue (real and imagined) was considered to be threatened by proximity to 'rogue' immigrant and working-class men, and to the Classically garbed Liberty, symbol of American civilization and enlightenment. (The savage v. civilization theme is one that reoccurs throughout the exhibition and is introduced in the very first line of wall text, which describes the war as an example of modern civilization's ability to "descend" into violence.) Other works in this section deal with the negotiation of changing gender roles, and the definition of an 'appropriate' space for women in war efforts. Technology is another important theme addressed in the exhibition. Watercolor, photography, airplanes, and barbed wire are among the innovations whose contributions to both battle and recovery, reconnaissance and remembrance are explored. A nod to current technology is also made in the digital installation of Horace Pippin's memoir of experiences (ca. 1921), from the Smithsonian Institution's Archives of American Art. 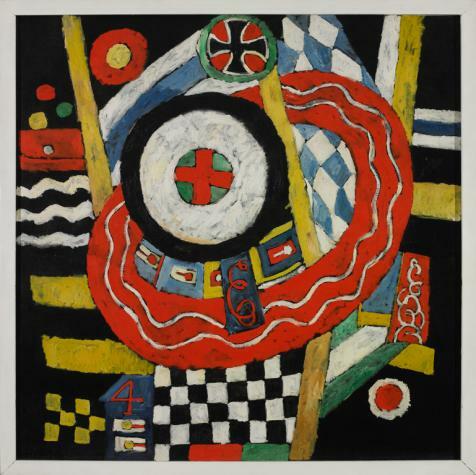 The final rooms of World War I and American Art, dedicated to Celebration and Mourning, deal with the immediate and continued aftermath of the war and how we go about remembering it at various times. Arthur Beecher Carles's The Marseillaise (ca. 1918) invites a thought-provoking comparison (and contrast) with Delacroix's Liberty Leading the People (1830), while other works lead me to consider the benefits and drawbacks of the tendency to interpret the First World War as a precursor of the Second. My personal favorites in this section are a pair of photographs by James Van Der Zee of "doughboys" Needham Roberts and Henry Johnson, entitled Two Soldiers (ca. 1919) and Looking Backward (ca. 1929). Overall, World War I and American Art is a highly stimulating exhibition that opens up significant and well-timed avenues of discussion of this 'forgotten' war, its embeddedness within modern American cultural and artistic development and discourse, and its relevance in light of current political dissidence. Its installation in Nashville, and the South in general, offers a particularly pertinent opportunity for meditation on the nature of memory and representation. Go, go again, spend time with the whole exhibition, and then spend more time with individual works. Next month, I will be presenting on the Gilded Age bathroom and issues surrounding bathroom preservation and interpretation in the historic house museum at the Annual Meeting of the Southeast Chapter of the Society of Architectural Historians (SESAH) in Lynchburg, Virginia. This Wednesday, July 26th at 11 a.m., two of my fellow Fellows at The Preservation Society of Newport County will be presenting their research at Rosecliff. Anna Rose Keefe will be presenting on Félix, the dramatic and largely forgotten French couturier who clothed such iconic Gilded Age figures as Sarah Bernhardt, Virginie Gautreau (John Singer Sargent's 'Madame X'), and Caroline Schermerhorn Astor. 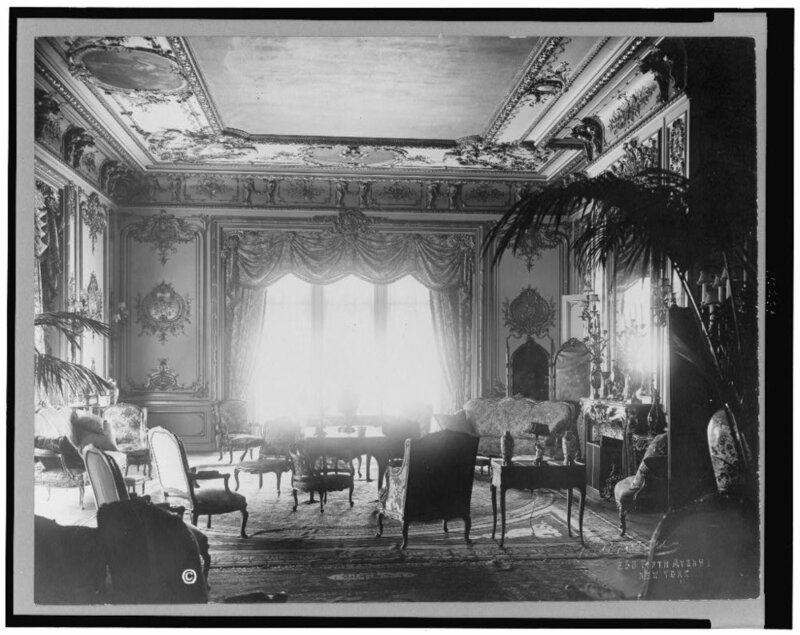 Amber Wingerson will be discussing the technologies and etiquette of Gilded Age interior lighting, from 'brilliant' ballrooms to dimly lit dining tables. Advance registration is required, and is available through The Preservation Society's website (here). This week I am out of the office and into the mansions, photographing bathroom fittings and fixtures at The Elms, Marble House, Rosecliff, and The Breakers—four of Newport's most spectacular Gilded Age residences. Among the things to which I am paying special attention in this process is hardware—the 'practical' stuff, regularly overlooked, and often the most useful in determining dates and arrangements. Fixed, immovable (on a regular basis), and positioned strategically for specific purposes, these, like the tubs, toilets, sinks, etc., are part of the bones of the room, and have much to tell about how and when they were used, disused, updated, and so on. Iron fixtures like the one on the left, a soap dish manufactured by J. L. Mott Iron Works, usually bear a maker's or manufacturer's mark. Along with the name of the manufacturer, these marks often include a U. S. patent number and patent date or dates, which can be searched (in many cases digitally) through the United States Patent and Trademark Office. With a firm date, these items can then be identified in the detailed catalogs, where they exist and can be accessed, produced by firms to advertise their wares. When the date matches the suggested date of the room, I know that the pieces are original; when they differ, I know that I have an update, a retrofit or, in rare cases, the opposite (a room with fixtures that significantly predate its design and construction), to unravel. Conversely, where no date for a room is known, fixtures are an excellent place to start. Where no hardware is found, certain identifiable patterns of holes in the wall suggest its original placement, and certain crack patterns, residual discolorations, and other traces can provide clues as to, for example, how an item was attached or of what material (certain metals react differently with certain stones) it was made. Custom fixtures—always a fun puzzle—stand out precisely for their exceptional (i.e. non-standard, unpredictable) qualities. For door handles, like the one on the right, the answers are not always straightforward. Which way a door opens (in many Gilded Age examples, there are at least two and sometimes three or four doors in a single bathroom) indicates a suggested or intended flow of traffic. The decoration on a door might be different on either side, each side decorated to match the decor and overall arrangement of the respective room of which it is part. In some cases, the level of decoration indicates a level of privacy or access: for example, a concealed door might draw attention away from the existence of a room beyond, or a plain door might suggest a primarily practical (service) function. In terms of hardware, several points can be considered in approximating a date or status: Do the handle and lock plate match those found on similar doors within the house? Is their design consistent with the rest of the decorative hardware in the room? and with the general decor? (This is particularly important in ensemble interiors.) Is the keyhole in any way obstructed (which might suggest an alteration)? And, finally, when the fixture is removed, do the holes, paint, 'age lines', etc., match with the current hardware? As always, histories of rooms over time are varied and variable works-in-progress. For bathrooms, however, the devil is usually in the details, and the details are usually to be found on the fixtures. When plumbing first made its way indoors around the mid-nineteenth century, the bathroom was hardly a luxurious place: technology was iffy, space and decor were limited to the strictly necessary, and individual bathrooms were shared by multiple members of a household. 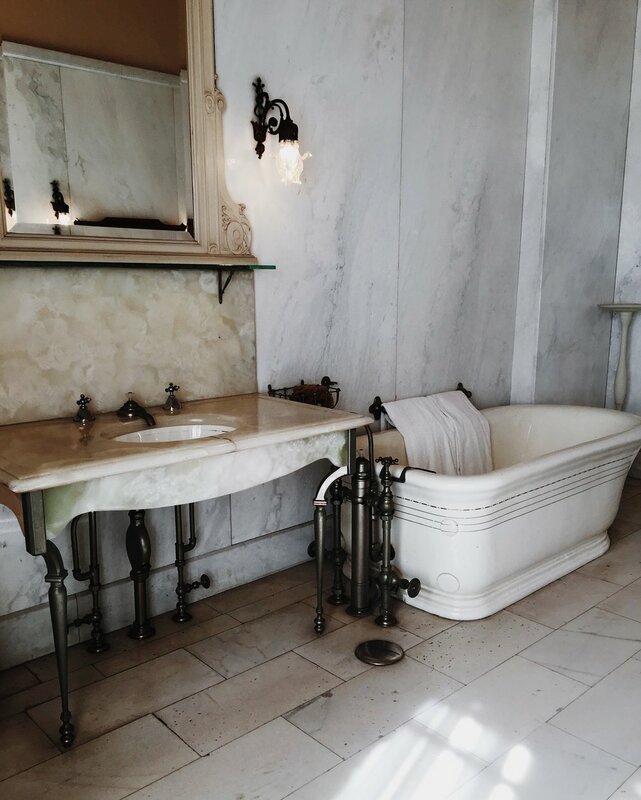 By the end of the century, America's first millionaire class had transformed the bathroom into the place of refinement that it remains in much high-end design today—a place for privacy, relaxation, rejuvenation, and, most importantly, style. Drawing on eighteenth-century French Classical models, bathrooms were elaborated into sophisticated multi-room suites that included sizable dressing rooms and closets for individual use, with porcelain and marble tubs installed in niches or near windows to provide picturesque views (both of bathers and of their delightful settings), and every conceivable comfort—many of which we take for granted today, e. g. warm running water—provided for. The concept of the 'master bath,' as distinct from the 'guest' and other baths was invented, and how one bathed became as indicative of one's social 'character' as how one dressed or dined. With the decline of the Gilded Age and the rise of apartment living in the early twentieth century, this historicized luxury bed-bathing suite fell out of favor to be replaced by more modern(ist) styles and trends. Now, 100 years later, in what has been called the 'New Gilded Age,' some of its characteristic features are creeping back into luxe design. The rise of germ theory in the 1890s led to a shift in bathroom design from the wood-encased and heavily textiled style popular in the 1880s to a supremely 'sanitary' aesthetic. Pipes and other fittings and fixtures were exposed for ease of repair and wood floors and paneling were replaced with more durable, waterproof, and fashionable Classical materials such as tile and marble. The Waterworks 'Henry' washstand, with its marble slab, porcelain basin, and industrial metal fittings, recalls late nineteenth- and early twentieth-century designs by manufacturers such as J. L. Mott (left), and its style has recently made appearances in chic London locales such as The Ned (center), The Hoxton (right), and Soho House. The bathroom of Meg Ryan's recently renovated New York loft (right) by architect Joel Barkley (Ike Kligerman Barkley) and interior designer Monique Gibson features a free-standing Water Monopoly tub with fittings by Waterworks, complete with white 'Subway' tile (see below) and Mott-esque slab-basin sinks, an arrangement not unlike that found in Mrs. Edward J. Berwind's Newport bathroom of ca. 1900 (left). 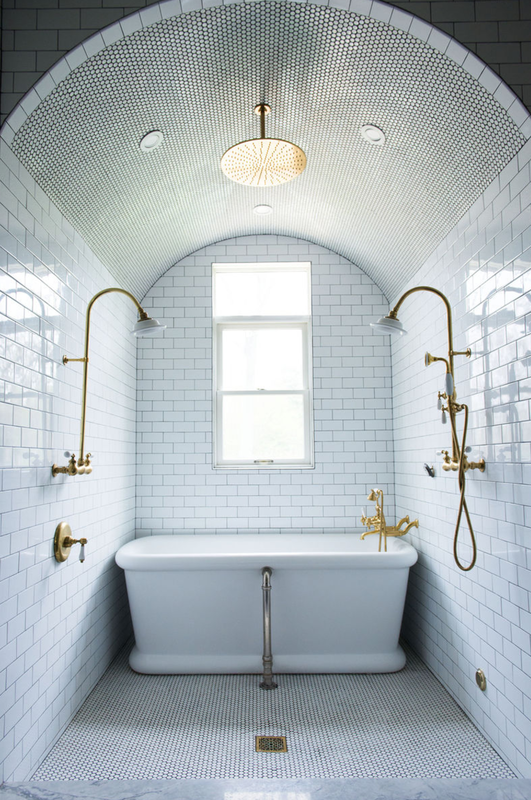 In the 1890s-1900s bathroom, tile was praised for its efficiency, cleanliness, and durability, as well as its decorative diversity. White 'subway' tile, so named because of its usage in the then-newly developed urban railway systems, was especially popular for its ability to expose dirt. 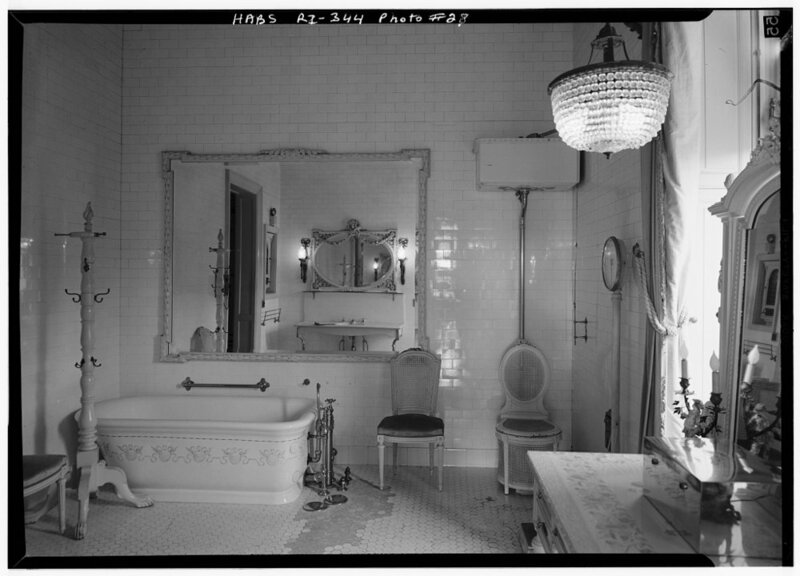 Now generally associated with Modernist simplicity, in the Gilded Age, white tile was often paired with more conventionally luxurious materials and appointments such as gilt-wood furniture and cut glass chandeliers to create bathing spaces that were at once modern and historical, efficient and opulent. Leanne Ford (right) is among the many designers making use of this subway tile in the bathroom today. 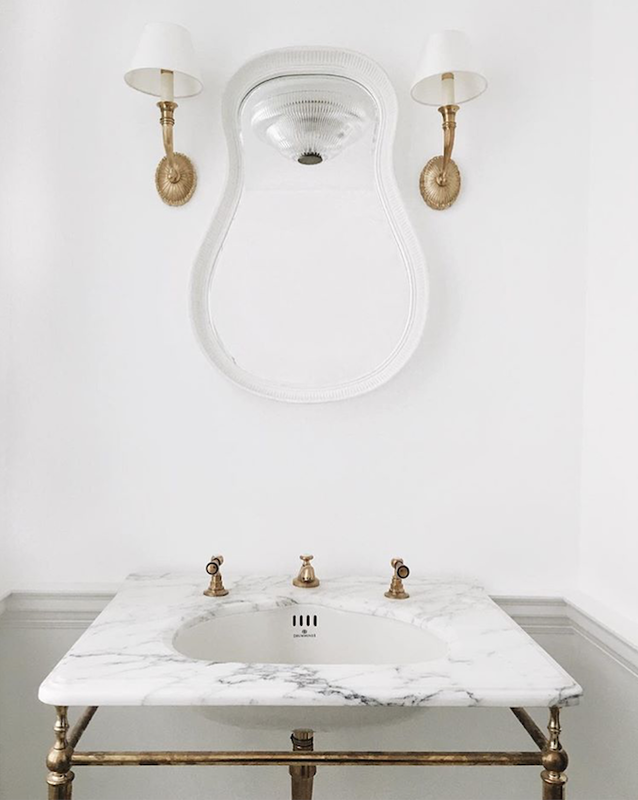 In the most luxurious Gilded Age bathroom examples, marble and onyx were the materials of choice for tubs, sinks, floors, and even walls. White Italian 'Statuario' (or statuary, sculptural marble—denoting the highest grade of Italian import stone) was particularly prized for its exceptional quality and its aggrandizing historical and mythological associations. According to interior designer Ferris Rafauli, Carrara and other "authentic" Italian marbles are once again "in high demand." C. P. Hart has identified marble as one of the chief design trends of 2017, emphasizing its ability to create a "timeless feel" when paired with warm metals, and Waterworks's Barbara Sallick (The Perfect Bath) has similarly emphasized its "elegance and sophistication." 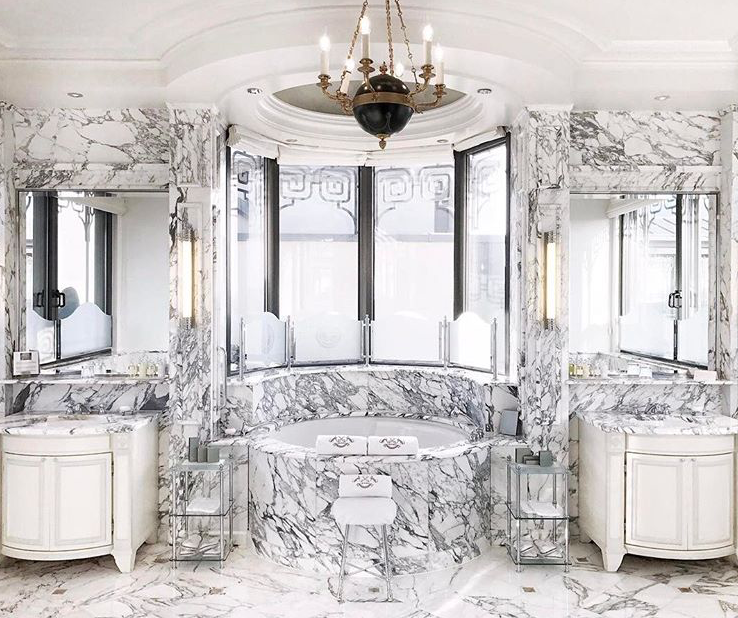 A bathroom at the recently renovated Le Meurice, Paris (right) features marble throughout. 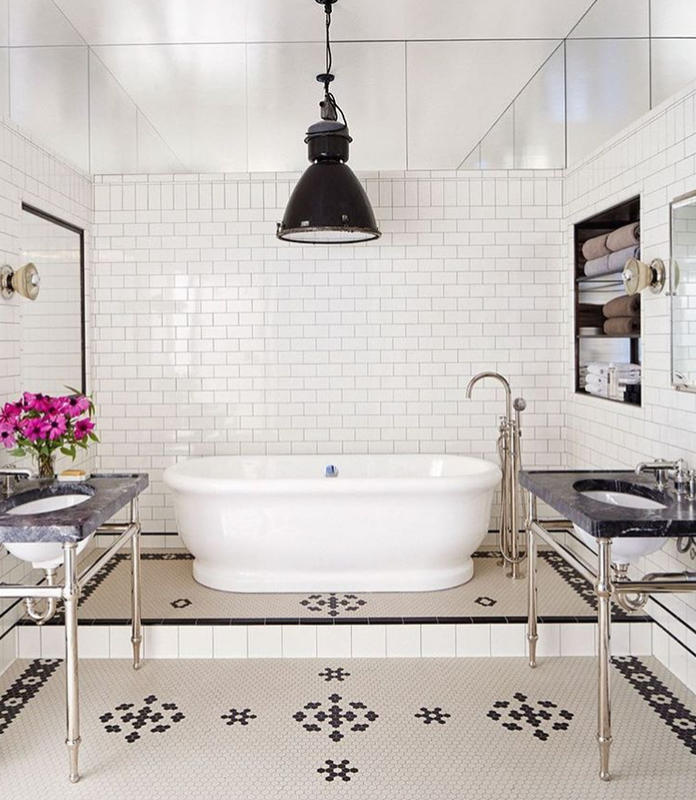 If time is any indication, the next bathroom trend on the horizon will be the bold and colorful glamor made popular in the 1920s and 30s. Pink tubs, black toilets, geometric light fixtures, and mirrored surfaces will replace the airy windows and all-white Beaux-Arts modernism of the early century. 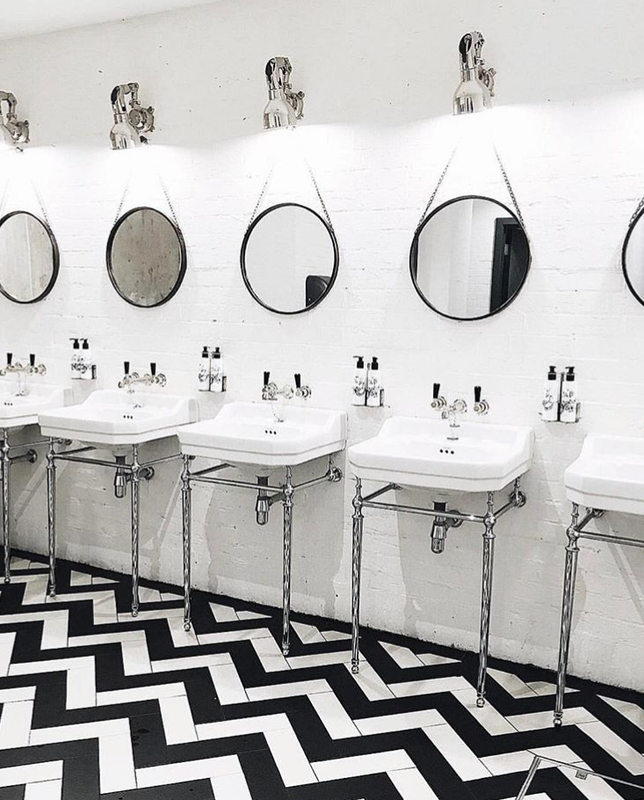 This fashion is already on the rise in the so-called 'power' powder room, where young, contemporary firms like House of Hackney are re-inventing bold, historically-informed prints and accessories for statement design. Think: Hollywood. 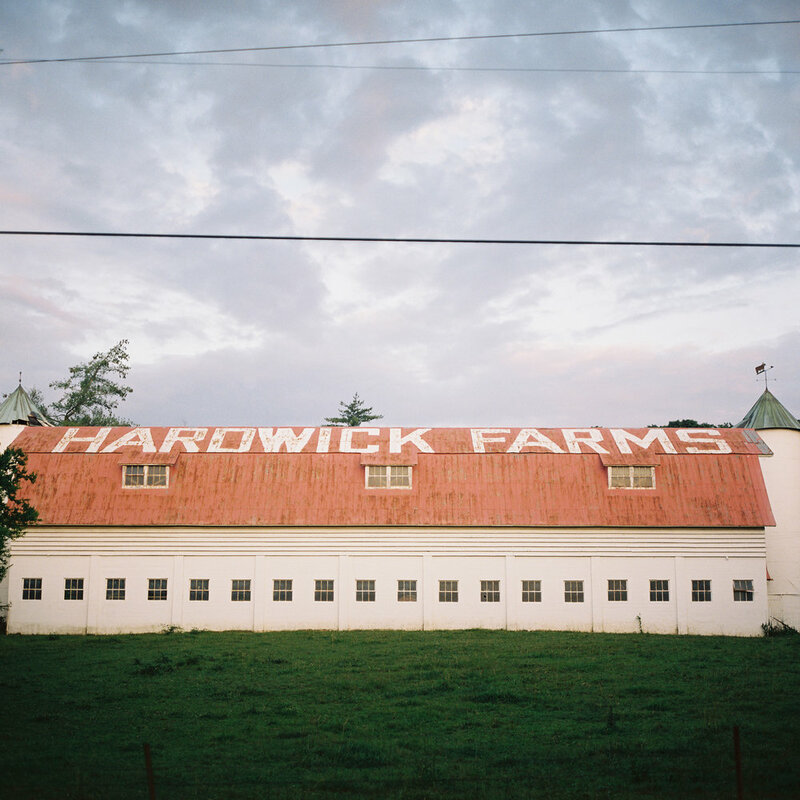 Hardwick Farms is the estate of Christopher Lafayette Hardwick II (1879–1961) located in Cleveland, Tennessee. Christopher Lafayette, or “C. L.,” as he was called, was the grandson of the pioneering local businessman Christopher Lafayette Hardwick (1827–1901), founder of Hardwick Clothes (Cleveland Woolen Mills, 1880; Hardwick Woolen Mills, 1925), Hardwick Stove Company (1879; acquired by Maytag Co., 1981), and other industries, and one of “the most substantial citizens of East Tennessee,” according to William S. Speer’s Sketches of Prominent Tennesseans (1888). He was a descendant of the seventeenth-century Hardwicks of Westbury, England. Designed as a gentleman’s or model farm, Hardwick was home to a nationally recognized herd of pedigree Angus cattle in the 1930s and 40s. 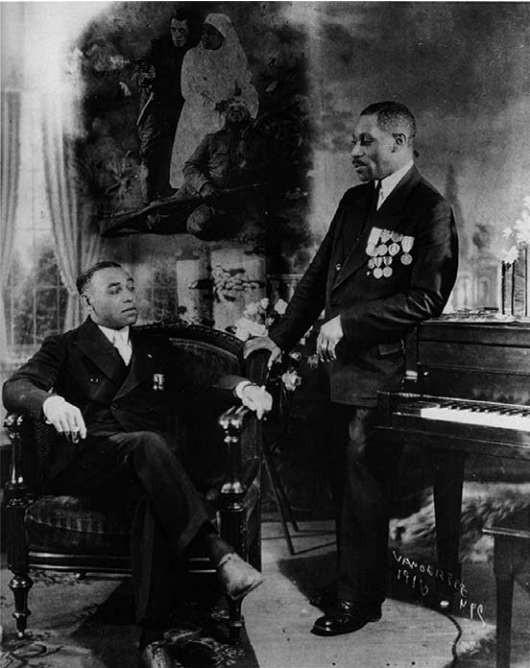 In the 1960s and 70s, following C. L.’s death in 1961 and the inheritance of the estate by his great-niece Joe Hardwick Corn Stuart (1922–2009), Hardwick Farms became a lively familial and social seat, hosting, among others, the late greats Duke Ellington and Benny Goodman and the Glenn Miller Band at some of the many entertainments that Joe—a U. S. Marine, philanthropist, and generous hostess—and her husband, Cpl. David Sullins (“D. S.”) Stuart, Jr. (1918–1984), held there. The house is an exceptional example of the American country house tradition of the 1920s and 30s, and was built in the Spanish or Mediterranean Revival style popular in the first half of the twentieth century. 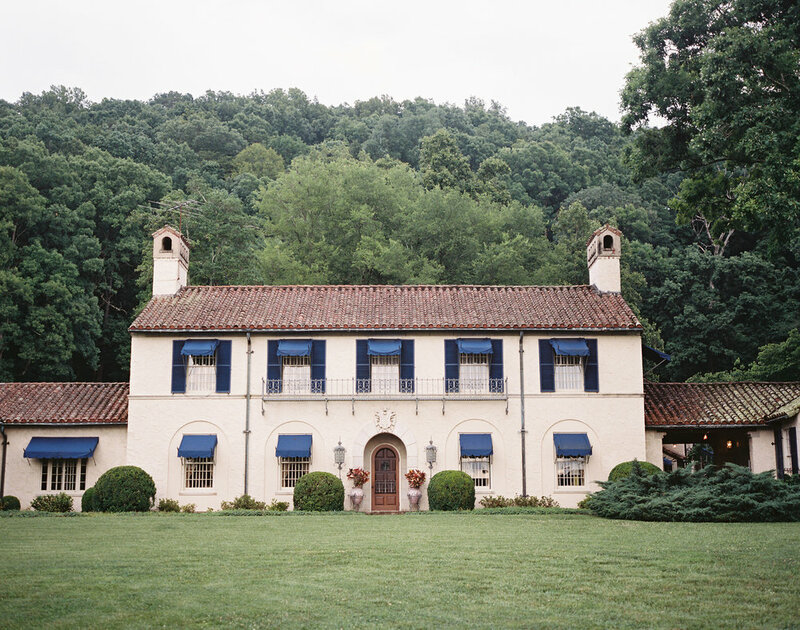 It was designed in 1933 by the Knoxville architecture firm of Barber & McMurry (now BARBERMcMURRY), and features a symmetrical Georgian-inspired façade—a Southern twist on a style more often associated with California and other coastal regions, regularly laid Spanish tile roof, and arched porch overlooking a small spring-fed lake and waterfall. Notable among its interiors are a hand-painted scenic Chinese Dining Room wallpaper, paneled gentleman's library, and an Art Deco powder room outfitted with state-of-the-art period fixtures by Standard Mfg. Co.
On the grounds of the estate are an expanse of virgin woodland and a natural spring; two man-made lakes; original farm buildings including a smokehouse and a working-turned-cabaret barn; as well as rare and exotic plant and tree specimens cultivated by the late Mrs. Stuart, who was an avid gardener and a discerning florist. Though changes have made to the estate over time, the interiors of Hardwick House remain remarkably intact, and recent research has shed new light on old rooms: what the family now use as a den, for example, spatial arrangement suggests and original blueprints indicate was originally designed as an office for Mr. C. L. Hardwick, complete with separate entrance and bathroom in typical late nineteenth- to early twentieth-century gentleman's residence fashion. Thanks to the completeness of the house and the extensiveness of its records, there are still many discoveries to be made about it, and about the significant and as yet little-understood American building tradition that it typifies.